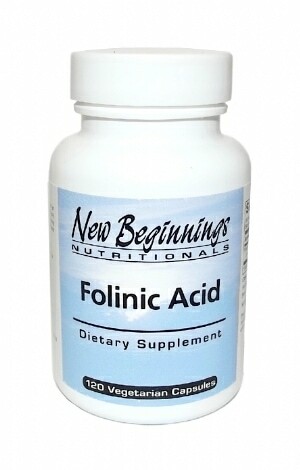 Folinic acid is a water-soluble B vitamin that is essential for growth and cellular division. 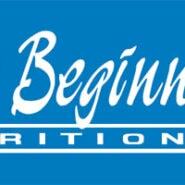 It is required for carbon transfer, amino acid conversions, and maturation of blood cells. 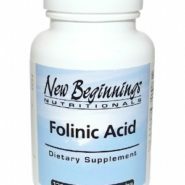 Folinic acid is more readily transported into the central nervous system than folic acid, has a longer half-life in the body, and it appears to be a more metabolically active form of folate, capable of boosting levels of the coenzyme forms of the vitamin in circumstances where folic acid has little to no effect. Along with TMG (trimethylglycine), and methylcobalamin, folinic acid helps to convert homocysteine to methionine. Suggested Dosage: 1 capsule daily or as recommended by your health care practitioner. Other Ingredients: Microcrystalline cellulose, powdered cellulose, hydroxypropyl methylcellulose, silica.